This week, our curator Grant is taking a well-deserved vacation, and I am once again in charge of the museum. Now that I’m coming to the end of my time as museum intern at Banting House, I feel pretty comfortable in the role of caretaker – however, I’m certainly not alone! Being in charge helps me realize how dependent we are on our volunteers here at Banting House – without them, very little would get done. Volunteers at Banting House come from many different walks of life. They can be high school students or retired seniors; anyone with free time who is willing to give it is appreciated. Most of the volunteers have some sort of interest in history or medicine which draws them to Banting House, but some just want to contribute to their community. Some have been affected by diabetes, or their family members have. The mix of people always makes for an interesting conversation. Normally, there is at least one volunteer in the museum in the afternoon from 12-4 while the museum is open. This allows for Grant and I to work on other projects, as well as give tours if we are needed. It really relieves the pressure of having to accomplish all our daily tasks in the mornings. The volunteers don’t only do tours – some work in archives, cataloguing the museum artifacts. Our registrar, Amber, is one of our most important volunteers. She has been working to modernize our catalog system and make it much easier to access. Another is Terry, our volunteer coordinator, who makes sure the volunteer tour guides are organized and knowledgeable. 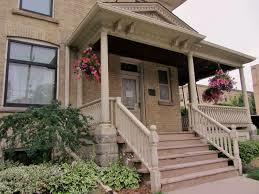 Banting House NHSC – A museum that runs on the dedication of volunteers! Without volunteers, smaller museums like Banting House would not be able to run at the capacity that they do – I especially notice how helpful they are when I’m running the museum without Grant here! They really are a cornerstone of Banting House. With technically only two staff employed at the museum this summer, Grant and I, they have been great. Throughout my time here, I’ve come to appreciate the huge contribution they make to the day-to-day running of the museum – they definitely deserve a big thank you from me! So thank you, Banting House volunteers, for all that you do – you have helped out immeasurably during my time here, and will continue to do so when my internship is over. Thank you for helping preserve Frederick Banting’s legacy for generations to come – it is very much appreciated. This post was written by Kylie Smith. Kylie specializes in Honours History and minors in anthropology at The University of Western Ontario.